Fried rice – is there anything better? I love how you can take innocent, singular ingredients and turn them into so much more. It’s funny how much regular, plain rice can change from being fluffy and slightly sticky, to crisp, intensely flavored and moreish. It’s absolutely one of my favorite things to make and eat. I like it simple and plain, with just eggs or all dressed up, like this BLT version. But, before we go into BLT fried rice, let’s chat a little bit about fried rice in general. It seems to me that sometimes people get confused about fried rice. Is it a side dish, is it a main, is it a vehicle for old, leftover rice? Just what purpose does fried rice serve? Well, friends, I’m to to tell you once and for all: fried rice is all of those things and more. Well, actually, it’s not really served as a side dish – most Chinese dishes are cooked with the intention to be eaten with plain white rice. Traditional, and even not so traditional, Chinese dishes are made to be extra saucy and flavorful so that the ever present bowl of rice served alongside is a sponge to soak up all the goodness. And while fried rice is sometimes served alongside traditional dishes, it’s more of an eat it on its own dish: good fried rice is incredibly flavorful on its own and shouldn’t need anything with it. With that being said, people have been known to choose the fried rice option over the plain option, which is just plain gilding the lily. I’ve definitely been known to eat fried rice alongside other dishes, but my favorite thing to do is just make a big batch of fried rice for a complete meal. If you do it right, fried rice will have your protein, grain, and vegetables all in one tasty bowl. 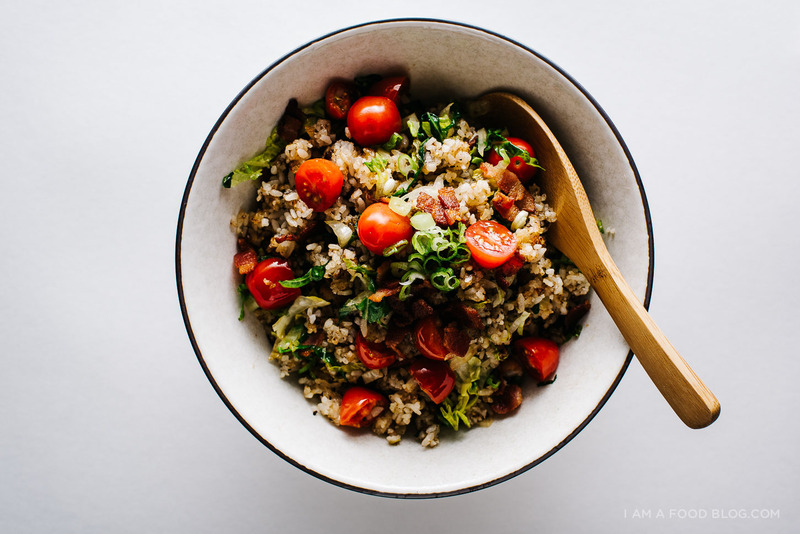 This BLT fried rice is the perfect example, with savory bacon, crisp lettuce and juicy tomatoes. You might be thinking that lettuce in fried rice is kind of strange, but there’s actually a Hong Kong style fried rice that features beef and crispy lettuce – it’s one of my favorites. I spun off that and went with the classic ingredients for a BLT, minus the mayo. The key to this fried rice, and all of them, really, is a really really hot pan. Make sure all of your ingredients are prepped before hand and give this rice a try. 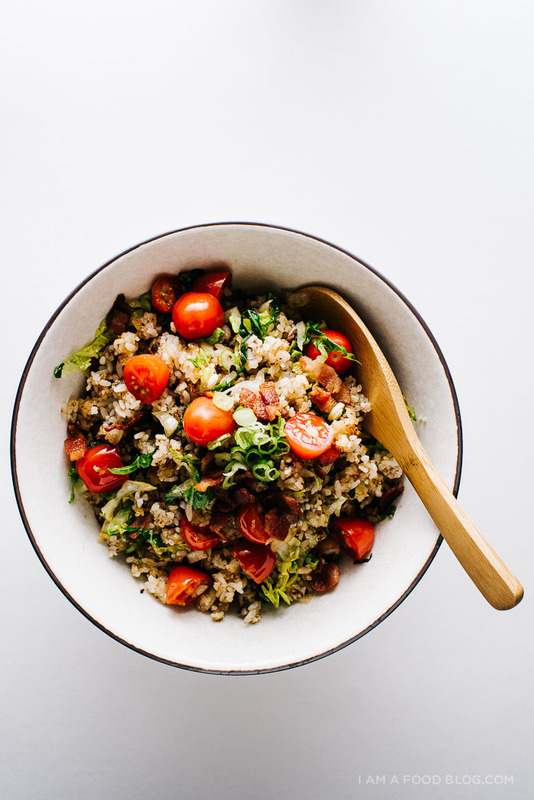 It’s a fun departure from your regular BLT and a super delicious bowl of fried rice. 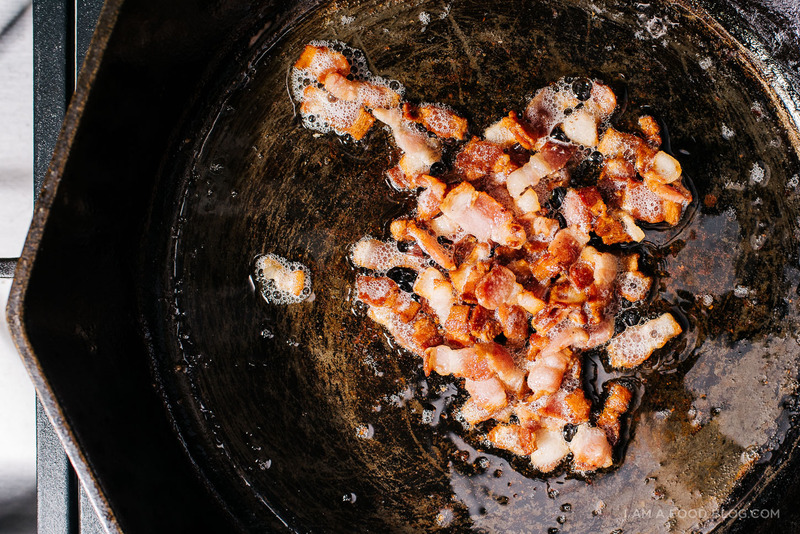 In a large cast iron pan or wok, cook the bacon bits until the fat is rendered out and pieces are crispy. Remove some of the bacon fat, reserving on the side. You want about 1 tablespoon of bacon fat left in the pan/wok. Add the onions and cook until softened slightly, 1-2 minutes. Turn the heat up to high and add the broken up rice and cook, undisturbed for 2-3 minutes. Toss and cook until rice is crispy and heated through. 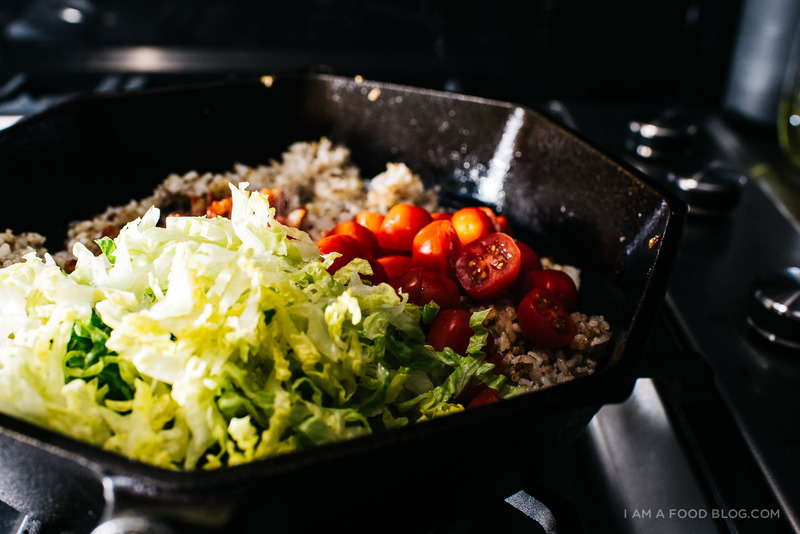 Add the romaine and tomatoes and cook for 1-2 minutes while tossing. Season with salt and pepper to taste and serve immediately. Note: Using old, cold rice is key. But cold rice tends to clump up and also key is breaking up the rice into individual kernels. Before starting your fried rice, break up the rice by wetting your hands and gently breaking up the clumps into individual grains. never thought about lettuce in fried rice until a couple months ago, when a korean restaurant put it in their fried rice. and when i asked my mom, she talked about it so casually that like she’d been withholding this from me all this time. i love how sweet and tender it gets when cooked into fried rice! gonna try the recipe soon! btw: love the owl bowl :) where did you get those? 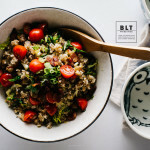 BLT fried rice! what a wonderful idea! 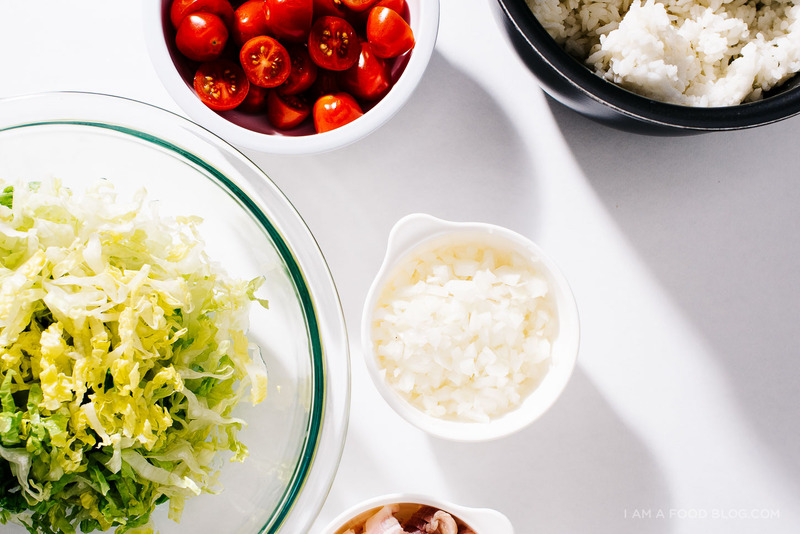 I have never seen lettuce in fried rice before and I really love this idea. One of my favorite aspect of Chinese food is the plain rice bowl accompanying each dish. I am such a rice fan. I’ve been known to eat white rice as a side to my fried rice (oops!). Definitely going to be making this one. There really aren’t many things better than fried rice! Also, obsessed with those owl bowls. I thought lettuce in fried rice was a little weird at first too. However thinking about it it would work extremely well, heated just enough to be warm but not wilted, a BLT Fried Rice would be a great dish to make for me to take to work. I learned quite a bit about fried rice today. I will be honest, I never truly knew how fried rice was made or how it should be properly served. Now I knows its place in the dinner table. This is delicious. A perfect recipe for a quick dinner. I love rice in all forms (fried rice, rice as a side, risotto, you name it) and there are so much different kinds of it. I will deffinitely try this twist on it! FRIED RICE IS MY EVERYTHING. One of my absolute favorite quick meals. 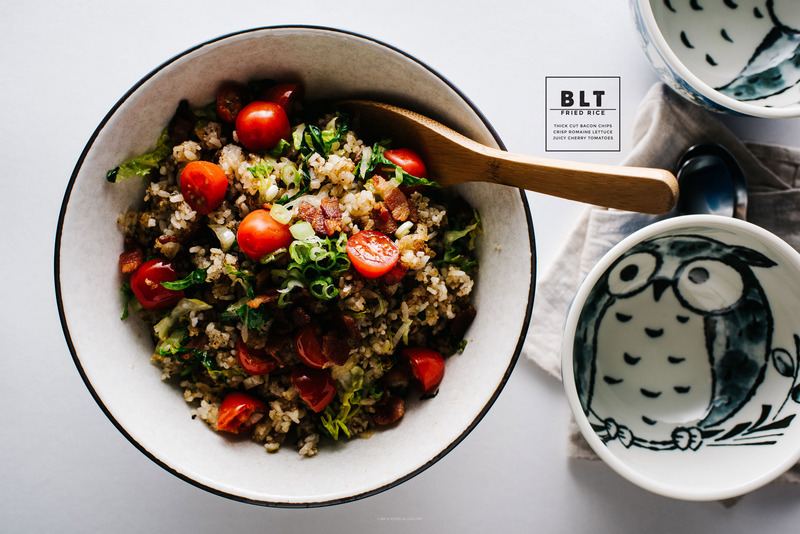 and HOMG, BLT fried rice!! YES YES YES, GF!! My mom used to make me bacon, eggs, and fried rice all mashed together like this. I love the idea of adding tomato! OH MY GOSH. Definitely will give this a try! Is the green onions mandatory? you don’t absolutely need them but they do add a bit of freshness! Amazing idea! I have to try it!! I made this with pancetta and topped it with kecap manis. Delicious and simple.